This item contains letters to James L. McDowell. Correspondents include Edmund G. Ross, Alexander Caldwell, Thomas Carney, Senator Preston Plumb, General Thomas Ewing, members and staff of the U.S. Senate and House of Representatives, individuals working for the Kansas State Fair Association, staff of the Department of the Interior - General Land Office, and others. The letters from Thomas Carney focus on topics such as the Fugitive Slave Law, the Kansas militia, and Missouri border trouble. McDowell held a number of public positions in his lifetime, from notary public to city mayor to U.S. Marshal and major-general of the Kansas militia (including organizing to defend the state during Price's Raid in 1864) to postmaster for Leavenworth. He was also actively interested in agriculture, helping to organize the first and later state fairs for Kansas. 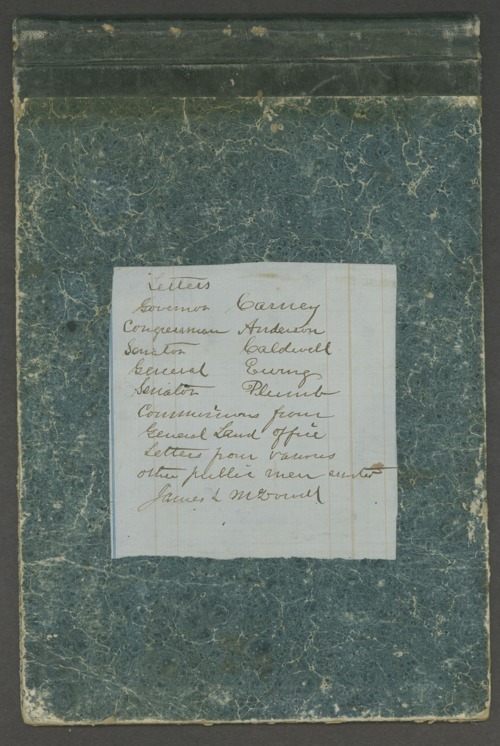 Collections - Manuscript - McDowell, James L.